Helix Nightfall Mattress Review - Extra Support? 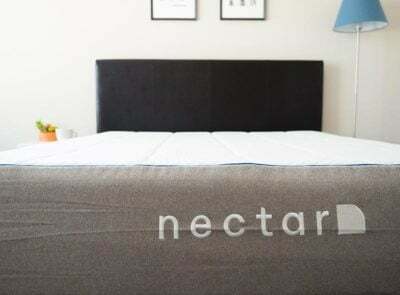 Home » Helix Nightfall Mattress Review – Extra Support? 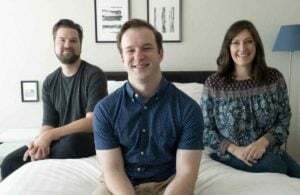 Helix Nightfall Mattress Review – Extra Support? 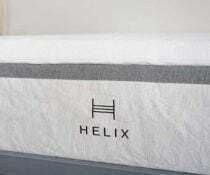 Helix has been very successful with its personalized mattress. 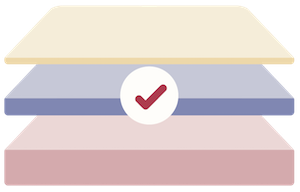 Customers have found the right mattress by taking a quiz regarding their sleep position, weight, and firmness preferences and then purchasing a mattress that is customized to these factors. Now, Helix offers three special mattresses made to fit more specific sleeping needs. One of these mattresses is the Helix Nightfall, which is designed to offer extra support for big and tall sleepers. As a larger person, I was interested to see how the Helix Nightfall would work for me. Did it give me the support I needed? Read on for my full review. You are a heavier person. If you are larger and worry about support or a sagging mattress, this might be the mattress for you. It has durable materials that will fight body indentations, and the extra tall coils should keep you well supported. You are looking for a long-lasting mattress. If you need a mattress that will last you for some time, the Nightfall could work for you. 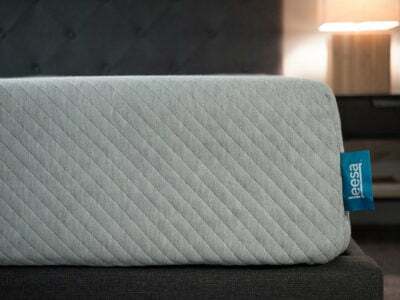 Its high-density foams and coils will ensure this mattress lasts for a while. You are a back or stomach sleeper who wants extra support. While this mattress is made for heavier people, it could be a good fit for anyone who wants a mattress with extra support. If you sleep on your back and/or stomach, you shouldn’t have to worry about your hips sinking in too far on this mattress. You are a lighter person. If you are smaller than average, this mattress really isn’t made for you. It will probably be too firm for most smaller people. If you are smaller, I would consider one of the other, softer models. You are a side sleeper. Even if you are a heavier person, this mattress may be a bit firm on your side. You may feel some pressure on your shoulders and hips. This mattress is quite firm, so you may want to look at a softer Helix model. You prefer a classic memory foam feel. If you like to sink into your mattress and sleep “in” it rather than “on,” this might not be the best choice. It has a balanced hybrid feel, so you sleep “on” the mattress. The cover has dual layers. The top is soft and stretchy; the bottom layer is designed to help with airflow and breathability. The first layer is 1” of Helix Dynamic Foam. It is a latex-foam hybrid. Next, you have a 1” layer of Ultra Dense Memory Foam. After that, you have a 1” transition layer of High-Grade polyfoam. This is an extra layer to help with contouring and support for heavier people. Then you have an 8” layer of individually wrapped coils. Finally, the base layer is 1” of Dura Dense foam. 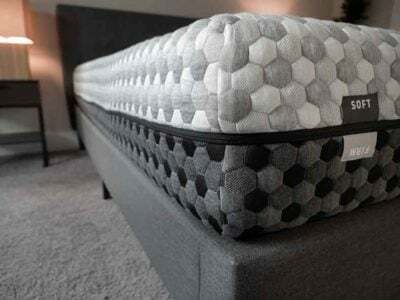 The foam layers are high-density, which should keep the mattress from sagging (as mattresses can often do with heavier people). The coils are specifically designed to handle heavier weights. They are taller and can take more compression than typical coils. They should give the extra support that heavier people need in their mattress. The mattress is also designed to keep you cool while you sleep. The cover is quite breathable, and the coils should allow for nice airflow. The durable components should make this a longer-lasting mattress. 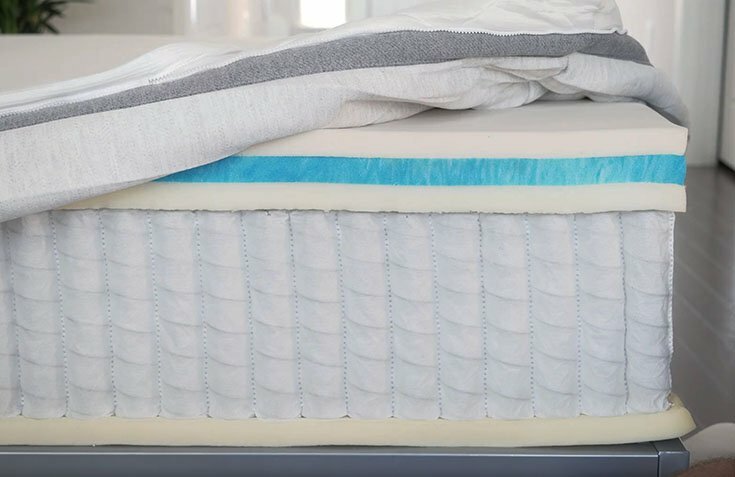 The high-density foams, coils, and durable base layer should give this mattress a long life. For me, this mattress felt like a 7 out of 10 in terms of firmness, or a bit firmer than average. It has a relatively soft comfort layer, but when I press down, I engage the transition layer and coils fairly easily.On my back, I felt very nice support. I felt the top foam layer pressing into my lumbar area. My hips sunk in a bit, but not too much. On my side, I did feel some pressure on my shoulders and hips. Again, I believe I was feeling those supportive layers beneath the comfort layers. Moving to my stomach, I felt well supported. I did not feel my hips sinking in as they often do when I am on my stomach. It was a very nice match for me in this position. In terms of feel, the mattress has a balanced hybrid feel. There is a bit of that responsive foam feel on top with the feeling of coils beneath. During my tests, I did see some motion transfer. The glass was disturbed when I pressed into the mattress. Also, when I rolled near the glass, it was disturbed. This was not surprising to me. While there is foam on top, it doesn’t allow you to sink in. All-foam mattresses are often better with motion transfer. Overall, I think the motion transfer was below average on the Helix Nightfall. If you are a larger person like me, you also want to know if you can use the full surface area of the mattress. Edge support is very important. 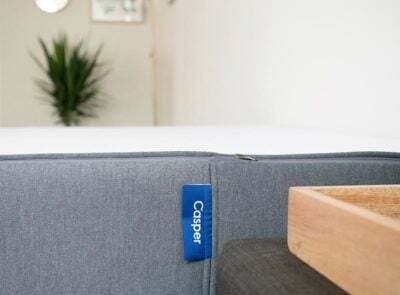 This mattress actually reinforces the outer coils to make the edge more secure. Sitting down on the mattress, I don’t feel like I am going to fall off. Also, when I am lying down, I feel like I can lie fairly close to the edge without rolling off. Overall, I felt the edge support was decent. It is supportive enough for heavier people. 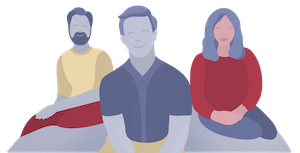 The taller coils and extra layers of high-density foam should ensure larger people get the support they need. The mattress shouldn’t sag. Heavier people often make indentations in their mattresses over time. The high-density foams are designed to prevent this sagging. Overheating shouldn’t be an issue on this mattress. The cover is breathable, and the coils allow for good airflow. You shouldn’t be getting hot on the Helix Nightfall. It should be a long-lasting mattress. Those same components that fight sagging should also ensure this mattress lasts for quite a few years. The Helix Nightfall is a bed-in-a-box mattress, which means it will come compressed and be shipped straight to you. You will want to begin by removing the rolled up Nightfall mattress from its box. Then, preferably with another person’s assistance, position the roll on your bed. Carefully cut away the first layers of plastic until the still-compact mattress can be laid down flat. Then, pierce through the final layer of plastic and the Helix Nightfall will expand. Simply clear away the excess plastic and allow your mattress to breathe and fully expand. I think the Helix Nightfall does a very good job of addressing the issues that heavier sleepers deal with. Lack of support and sagging are both addressed, and I feel very nice when I am on my back and stomach. Lighter people and many side sleepers may find this mattress to be too firm, however. There are many softer options in the Helix line. The Helix Nightfall comes with free shipping and returns, a 100-night sleep trial, and a 10-year warranty. There is also an optional cool cover for purchase as well as Helix pillows.